The average weight of ham is 20 lbs. 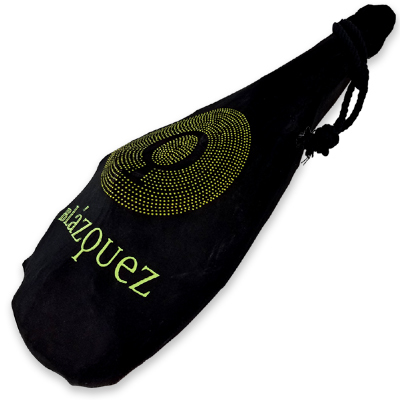 Each Blázquez ham "Admiración" has won its own right to be included in the selection of Blázquez products. Pieces chosen for their singularity, based on strict criteria that have been maintained and shared for generations. Each pure Iberico ham de bellota Blázquez preserves its own personality throughout the demanding, carefully monitored process of individually supervised preparation and curing. 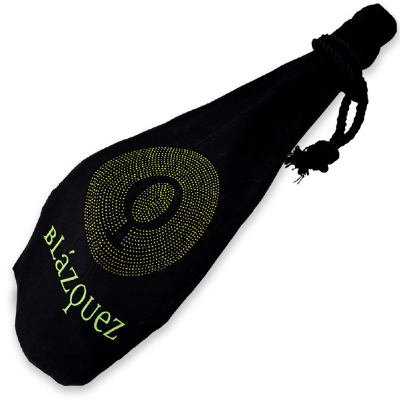 Blázquez’s methods upholds maximum quality through each phase of the product cycle guaranteeing that each mouthful offers the palate an authentic, unique experience in its aspect, texture, aroma, flavor and composition of lipids. 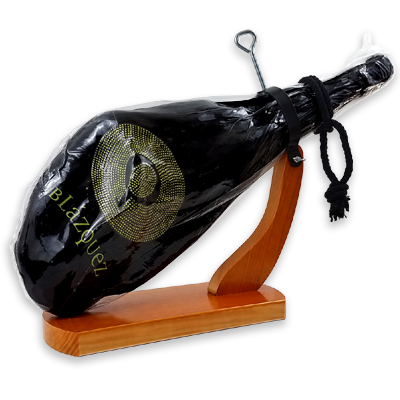 Pure Iberico Ham de Bellota Blázquez is an exquisite product made from the hind limb of the Iberian pig bred in the dehesa pastures of the Iberian Peninsula and acorn-fed exclusively during the period of mountaineering. This is a handmade product with a quality capable of doing the delights of the most demanding gourmets. Note - Hoof removed according to USDA guidelines. the ham wet and cool. If you notice mold patches on some areas of the ham is not a sign of that is in poor condition, this can be removed with the same fat or a little bit of olive oil. Something common and always bear in mind that easily shows the pure Iberico ham de bellota has been cured properly are the small white dots that we may find ourselves in the midst of the Iberico ham de bellota called TIROXINAS that gives a special aroma to the ham. 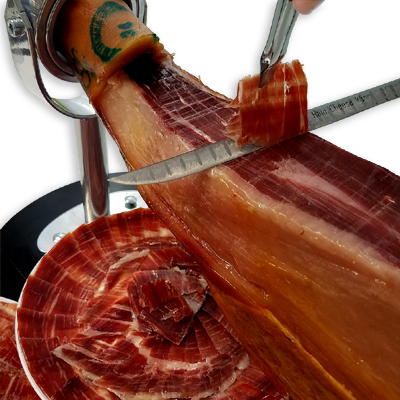 or most appropriate to cut an Iberico ham de bellota, we recommend you better make sure always base a more rigid and not move to the time of the cut. 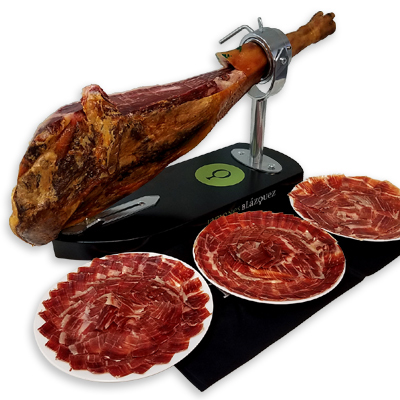 We keep the same advice for the case of knives, our company does not recommend using knives of low quality or cheap gifts that usually comes with the purchase, to cut-slice a pure Iberico ham de bellota we need three types of quality knives. 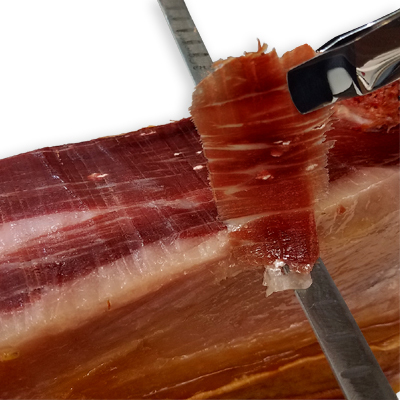 The main knife called “Jamonero”, la Puntilla for cuts and inserts around the bone and a stronger knife to clean the outer layer. 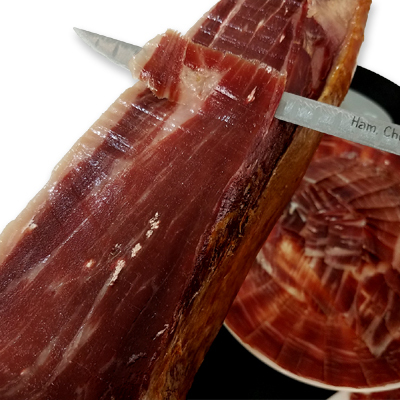 The flavor of a pure Iberico ham de bellota Blázquez will depend on your art to cut the Ham, with a fine cut or if possible almost transparent always the flavor of the ham will be much better. you now one of the best cured pure iberico hams Blázquez with total warranty. 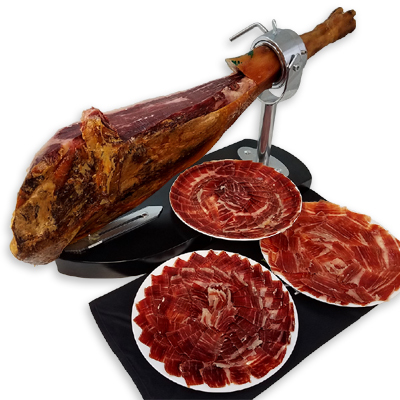 Our company was created by Francisco Carrasco (Paco), professional master ham cutter licensed from Spain and settled in Miami, Florida, United States. 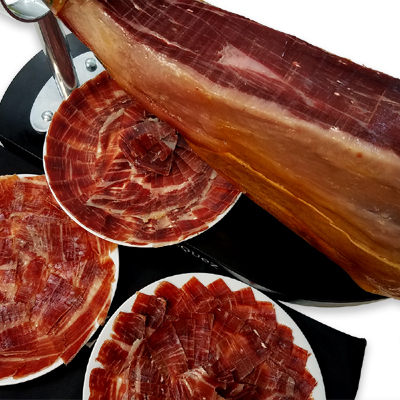 His experience of more than 25 years as a professional ham cutter guarantees you the best product choice of the best product Pure Iberico Ham de Bellota Blázquez. snow or ice; a dry environment by the day and wet in the night. 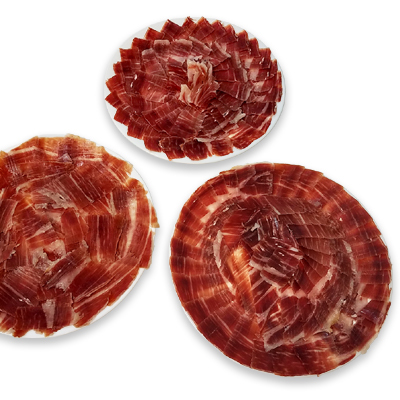 These features make Guijuelo a privileged place and unique to create the best cured pure Iberico ham de bellota. There is no other place in the world that meet these qualities so favorable to achieve a pure Iberico ham of maximum quality; therefore, Jamones Blázquez leads since 1932, making in Guijuelo the authentic Pure Iberico Ham de Bellota Blázquez. the so-called extensive diet. In this natural habitat the Iberian pig is fed freely of all the fruits the dehesa pastures provides. Blázquez only has pure Iberian pigs distributed over a thousand hectares of grasslands in freedom of this purebred. The pure Iberico de bellota pig, as its name indicates is fed mainly from acorns and other fruits of the fields graze freely in the dehesa. The mountaineering fosters the infiltration of fat between the muscles of the pig and transferred those aromas and exquisite flavors to the authentic Pure Iberico Ham de Bellota Blázquez. in cutting and separating the best pieces, the salting which consists in putting in contact the ham with the salt for a period of time so that the salt penetrates its interior, the drying process that takes place in the dryer and complete natural maturation and, once matured the piece is passed to the process called "aging", and that is carried out in natural cellars. As a result of the drying and aging, the water in the meat is reduced and the Ham get a greater concentration of solid, finally reaching the aroma and taste so characteristic of Pure Iberico Ham de Bellota Blázquez.